If that name either means nothing to you, or at best, only rings the slightest of bells (yet you can’t quite place it), congratulations. You are still among the certifiably sane, and weirdness has passed you by or has only merely touched your life, not taken root like some damned tumor, rotting away at your insides and unraveling your precious sanity. But, if that name is near and dear to your heart, then I’m sorry to be the one to break this to you, but there are only two conceivable explanations: 1) You are some sort of crazed freak, a drug-addled fiend roaming the streets armed to the teeth, on a savage journey desperate to find the very nerve of the American Dream. Or, more likely, it’s 2) You’ve been repeatedly assaulted with subliminal pop culture references, and much like Neo sought out Morpheus in The Matrix, you found yourself looking for him and learning all about his bizarre world. Thompson’s story is a strange one in virtually every way imaginable. He was predominantly, until his death by his own hand in 2005, simply a journalist specializing in sports and politics. But that’s where the simplicity ends. 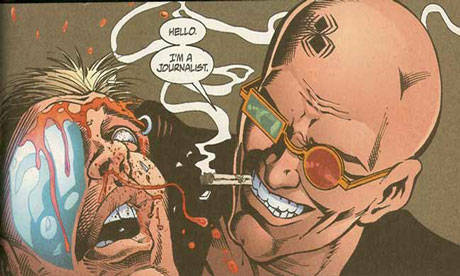 He’s considered the father of “Gonzo Journalism,” a form of writing that’s based in roughly 10-20% factual events, the rest being a completely depraved and thoroughly entertaining fabrication that injects the author into the midst of the action, and usually under the influence of at least one or (many) more mind-altering substances. He was the right man for his time and place, championing “Freak Power,” excessive drug and alcohol consumption, freedom from the tyranny of the Batman to his Joker, Richard M. Nixon, guns and explosives, and the joys of a hedonistic lifestyle. It’s no surprise that he became a counter-culture icon. But a pop culture icon as well? Now, that’s a bit strange, don’t you think? Actually, it’s not. But it did take a much longer and even stranger trip to get there. When people talk about Christopher Nolan’s The Dark Knight, does anyone still rave about what a unique and nuanced performance Christian Bale gave as the titular hero? No, they don’t. Posthumous or not, it’s Heath Ledger’s turn as the Joker that still haunts and captivates audiences to this day. And why is that? Because we love a good charismatic villain, that’s why. And that’s exactly what Thompson was to half the nation. But then there was the other half, the half that identified with him, those who couldn’t see him as a villain. But what character archetype do we love more than the moustache-twirling villain? You guessed it… the anti-hero! And that’s exactly what he became to the rest of us. A modern-day outlaw, filled with true grit and wielding an IBM Selectric typewriter instead of a six-gun, determined to undermine the establishment and tell us the truth, or at least his truth (be it fabrication, hallucination, or what have you), no matter the cost. He was a rock star, rebel, and guru to the masses that didn’t fit in with Big Brother’s idea of what American society should be. So naturally, like any other freak, they concocted a brand for him and paraded him around on radio, television, and virtually any form of media that would have him. They bought the rights to his works, and set out to bring Gonzo to the silver screen. This is the way that a counter-culture icon makes that uneasy transition to pop culture celebrity. A handful of toys here and there, some commercials, a whole galaxy of multicolored t-shirts, stickers, buttons, and patches, and even a line of USB flash drives. His influence has even infiltrated the most holy and revered of family entertainment, Disney, as there’s no denying that at least a good portion of the performance by Johnny Depp, Thompson’s über-famous pal, in the Pirates of the Caribbean quadrilogy , was based on the author’s quirky mannerisms. Like it or not, Hunter S. Thompson’s twisted legacy, through pop culture, has permeated our everyday lives and consciousness. With all the unlikely bits and baubles sporting Thompson’s name or likeness – and given the good doctor’s penchant for intoxication of one kind or another – it should come to no surprise that one of the products that most effectively capitalize off his image and legacy (and quite authentically, at that) is… a beer. In Part II of this post, I will dive deeper into the heart of the Thompsonian dream by way of a certain little beer with a big bite that started out as a microbrewery in Aspen, Colorado and went on to conquer the world in the name of Gonzoism.